Why is Russia’s Eurovision group so popular? Could it be because they show an aging world that all is not lost with time? They still use wells to get water in the village of Buranovo. And you have to stoke the furnace if you want to keep the house warm or make dinner, which calls for substantial stocks of firewood. Every household keeps cows or pigs in order to support the family budget. These animals require round-the-clock care. In summer, locals work in their vegetable gardens, growing potatoes and other greens. Local life is based on hard manual labor, and hardly anything has changed here in the last 100 years. 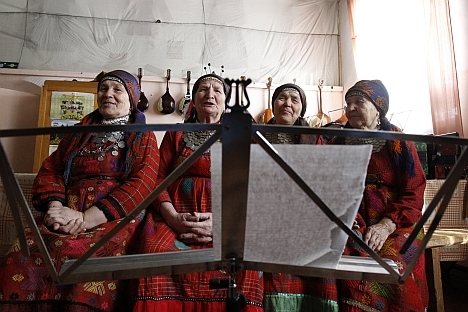 The Buranovskie Babushki have lived in this village for more than 70 years, but since they became Russia’s entrant in the Eurovision Song Contest, reporters from around the world have flocked to their home in the Republic of Udmurtia. They don’t believe their group is anything special either. “There are many people like us,” they say. Indeed, there are numerous vocal bands composed of war veterans and pensioners in Russian villages – what else is there to do on long winter nights but sing in choirs? However, the Buranovo Grannies have been luckier, or rather, they have a shrewd producer. In 2008, they became an overnight sensation after performing folk versions of songs by Russian rock legends Viktor Tsoi and Boris Grebenshchikov. In 2010, they participated in the Russian national Eurovision selection, but came third. They made another attempt this year and won. What’ss more, regardless of the outcome, you can be sure that no Russian participant in the Eurovision Song Contest has ever created such a buzz among foreign audiences. Not a single day passes in Buranovo without foreign reporters arriving in the village. By mid-April, Buranovo had welcomed journalists from the United States, the UK, Germany, France, Japan, the Czech Republic, Poland and Finland. The local authorities have been pleasantly surprised by all this commotion and are making plans for hiking routes to the huts where the babushkas live, and organizing tours to cowsheds. The buzz has even reached the sphere of international relations – the Estonian culture minister has called on his nation to vote for the Russian group. Given the rather cool relations between Russia and the Baltic states, this appeal sounded quite surreal. There is an explanation, though: the Udmurt and Baltic languages belong to the same language family; therefore, these people are somewhat related. In any case, the appeal to vote for Russia means a great deal. Even before stepping onto the Eurovision stage, the babushkas have had success in strengthening intergovernmental relations. They also plan to tour several foreign countries soon, so their efforts to build up the positive image of Russia abroad will continue. Yet, the question remains as to why they are so popular. Folk art, subsistence farming and century-old clothing are all very attractive, of course, but they are not enough on their own to garner such popularity, as other countries also have exotic things to offer. Maybe it is because they are grannies? It is widely believed that the modern world is run by a cult of youth. And beauty. This is true, but there is another modern trend – developed nations are getting older, or rather, people are living longer. There are an increasing number of countries where there are more pensioners than children. In Monaco, people aged 65 and over account for 22 percent of the population. In Japan, that number is 20 percent, in Italy 19 percent, in Germany 18 percent, and in Spain 17 percent, while the share of children remains under 14 percent. The age structure of society is changing before our eyes. There are no surprises when a young beautiful person enjoys a successful career. It is taken for granted that you can achieve anything you want if you are young, provided you have ambition and opportunities. But is there life after 70? It seems that a growing part of society in developing countries has taken a serious interest in this matter. If you “have to” live longer, and it looks like you do, thanks to developments in medicine, cosmetics and the promotion of a healthy lifestyle, then what sort of life will you have? It is clear that the countries with a significant older population will have to address the age issue sooner rather than later. The Buranovo Grannies have found their answer. They started singing a long time ago in a local social center. But they never had plans to conquer European show business in their 70s. However, if life gives you the chance, then why not take it? Additionally, they have outside motivation – they dream of restoring the local church, which was demolished during the Soviet era, and plan to donate a portion of their royalty payments to the project. Suffice to say that their lives will be pretty busy for the next 10 years or so.